The USA Scientific Mini Centrifuge SD offers you the convenience of uninterrupted workflow right at your fingertips. This personal centrifuge is great for quick spin downs to get fluid down from tube caps and walls, and operates either with the on off switch or by opening and closing the lid. This microcentrifuge is fixed speed and runs at a speed of 6000 rpm, with a force of 2000 x g. This mini centrifuge is outfitted with a 6-place fixed angle rotor for 1.5 or 2 ml tubes. 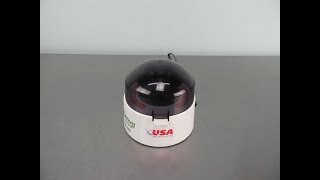 This USA Scientific Mini Centrifuge SD has been fully inspected and operated without issue. All of our lab equipment comes backed with our standard warranty. Should you have any questions, please don't hesitate to contact us.